The Presidency of the Council of the European Union caught Romania in a difficult position, both from a political and macroeconomic perspective. Following multiple blows to judicial system from part of the Government ruled by the Socialist Democrat Party, Romania’s commitment to the European values has been rightly called into question. Moreover, Romanian Government ability to lead through a tough European agenda including Brexit negotiations, trade relationship with the US and immigration issues is another difficult point as domestic challenges take the limelight. 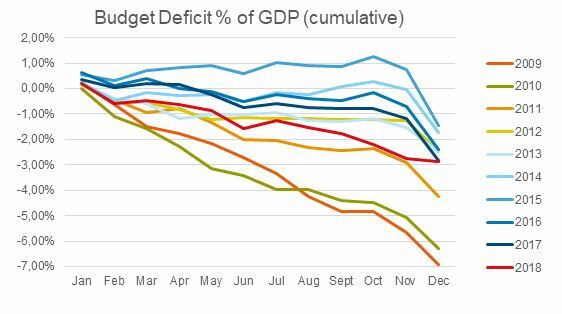 Mounting pressure on the budget deficit and the Government’s attempt to keep it within 3.0% of GDP led the Minister of Finance to announce at the end of last year a new fiscal revolution, after the one introduced for 2018. The Government approved through an Emergency Ordinance key fiscal changes for 2019, with major negative impact on key sectors of the economy, such as financial, energy and telecom. The main fiscal measures include a progressive tax on banking assets, which is linked to money market rates. This effectively is a blow to monetary policy independency, as hikes would lead to a permanent increase in money market rates, with negative impact on banks profitability and thus affect financial stability. As a consequence, banks will most likely revise their strategy and tighten lending conditions. Moreover, the Government introduced a turnover tax to companies operating in the energy and telecom sectors. These taxes will significantly reduce potential economic growth, tighten financial conditions and lead of lower investments. On February 4th, the Central Bank Governor will have a formal meeting with the Government, where we expect these issues to be discussed and potential amendments to be proposed. The Ordinance also includes changes to the mandatory private pension system (Pillar II), after many months of speculation. Although the approved version waters down the initial proposed changes, the implications remain significant and even question the future of the Pillar II in its current structure. The Government decided to lower the management fees paid to the existing pension fund managers significantly, while demanding these managers to increase substantially the capital requirements. In the long-term Romania is facing a significant demographic problem and thus jeopardizing the future of the private pension system while increasing the public sector pensions creates the perfect formula for failure. Investors’ cautious view on Romanian assets due to deteriorating macroeconomic fundamentals and significant policy uncertainty started being reflected more significantly in the assets’ prices. 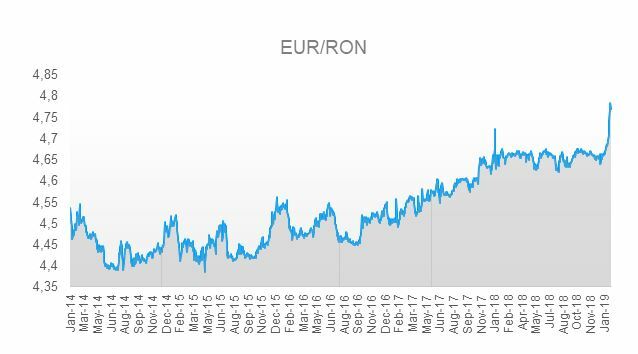 Facing a twin deficits challenge, RON lost 2.3% against the EUR this year, making it among the worst performing EM currencies year-to-date. The tight grip of the Central Bank on the currency prevented large movements in 2018, although the ballooning twin deficits increased market expectations of a weaker RON. As annual inflation dropped to 3.3% in December, within the inflation target interval of 1.5% – 3.5%, the Central Bank allowed RON to depreciate in nominal terms against the EUR more substantially than in the past. In the long-term, some of the new taxes could be passed on to consumers, while RON depreciation will add to the inflationary pressure. Thus, the Central Bank is caught between a rock and hard place, trying to juggle both money market rates and the exchange rate. Fighting RON depreciation through FX intervention will lead to higher money market rates, which could put pressure on the financial system stability through the higher tax rate. However, given the important FX pass-through to inflation, too much RON weakness could jeopardize the inflation target. The fiscal deficit for 2018 printed at 2.88% of GDP on a cash basis, barely below the 3.0% threshold, and the Government is yet to publish a budget draft for 2019. The fiscal package approved at the end of last year is unlikely to cover the gap and keep the deficit within the 3.0% of GDP limit, especially when considering the planned hike in pensions starting in September this year. Consequently, we could see further fiscal tightening measures announced in the coming weeks. In light of this, we are cautious on the RON until there is further clarity on the fiscal package and potential changes to it. Brexit: How resilient is the financial system?